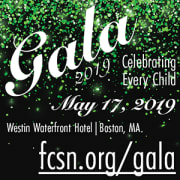 Join us on Friday May 17th, at the Westin Waterfront Hotel for Gala 2019: Celebrating Every Child, an evening of inspiration, fundraising, and enjoyment to benefit Massachusetts’ most prominent organization supporting families and children with special needs. This year, we are particularly excited to honor our Executive Director Emeritus, Rich Robison, for his 22 years of leadership and advocacy at the Federation. Rich will be honored with the Martha Ziegler Founders’ Award, which recognizes those who continue Martha’s vision to educate, advocate and inspire. Our President’s Award will be presented to Mark Kelly, Director of Special Needs for Newton Parks and Recreation and the Patricia Blake Advocacy Award will be presented to Elaine Gabovitch, Director, Division of Children and Youth with Special Health Needs, Massachusetts Department of Public Health. If you are interested in volunteering for this event, please contact Mary Lewis-Pierce at mpierce@fcsn.org or call 617-236-7210. Good under stress, pleasant demeanor, fun and energetic, comfortable with multiple media platforms, app use, personable and friendly.